Cardiology Update 2016 will cover a variety of topics revolving around the pivotal themes of heart failure management and stroke prevention in atrial fibrillation. This meeting, boasting an International Faculty of experts who have contributed directly or indirectly to the formulation of recent recommendations in the ESC guidelines, will represent a unique platform for health practitioners to discuss the most relevant issues regarding patient management and clinical outcomes. The meeting will be interactive and offer ample time for questions and answers sessions, as well as panel discussions on very relevant topics regarding heart failure management and stroke prevention. Cardiology update 2016’s scientific programme offers a wide scope that will be of interest to cardiology trainees, consultant cardiologists, haematologists, medical practitioners, nurses and researchers in the field. Registration for this meeting is free of charge for UK residents. Non-UK residents please contact maria@vantagepointmedical.com for further information on payment. The programme has been devised exclusively and independently by the scientific committee with no intervention from the sponsors. Sponsorship has been made available by Industry in the form of unrestricted educational grants or corporate sponsorship. ‘Cardiology Update 2016: Management of Heart Failure and Stroke Prevention in Atrial Fibrillation – New Guidelines’ has been approved by the Federation of the Royal Colleges of Physicians of the United Kingdom for 6 category 1 (external) CPD credit(s). 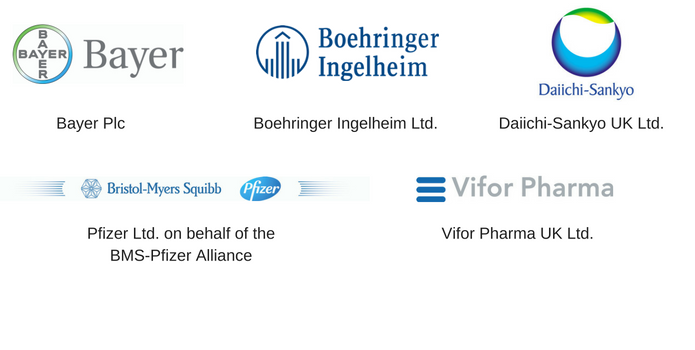 Financial support for this scientific meeting was provided by the companies listed below. The organisers confirm that none of the sponsors were at any point in time involved in 1) the organisation of the meeting, 2) the selection of topics or speakers, or 3) the development of any aspects of the scientific programme.